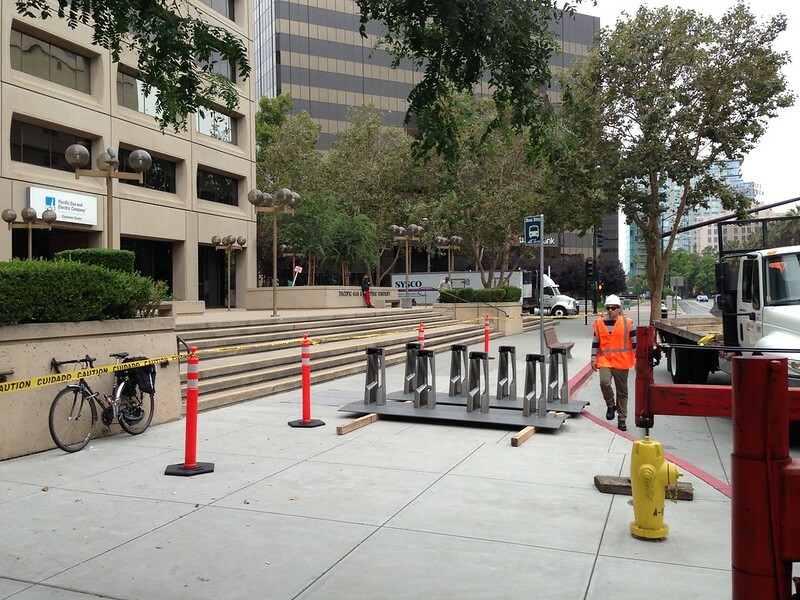 The first Bay Area Bike Share stations have landed in San Jose. 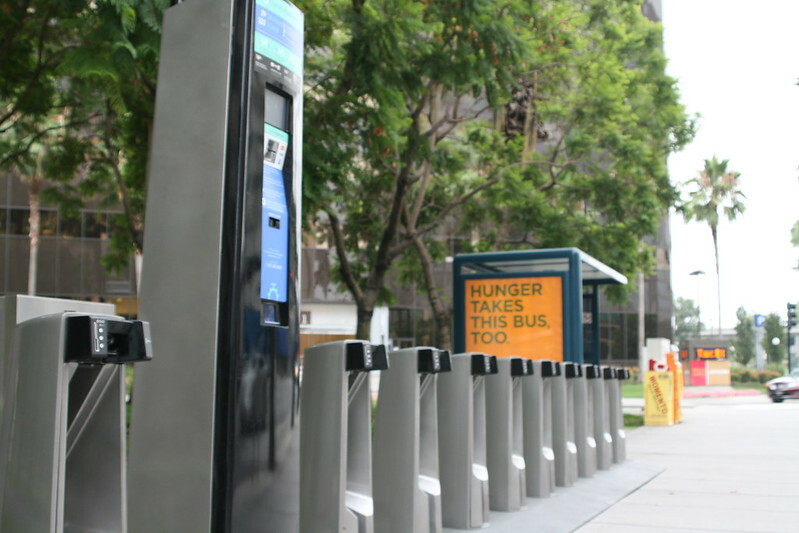 System operator Alta Bicycle Share began the roll-out yesterday with five stations and another five today, with five more coming tomorrow, said John Brazil, San Jose’s bike and pedestrian program manager. Video: John Brazil/FlickrSee more photos after the jump. What’s the size of San Jose’s program? Obviously, bike share can only work when there’s a huge volume of bikes available… Pilot programs be damned. Aaron, San Jose was first because they got the necessary paperwork done the fastest, but I’m told San Francisco is close behind and should be ready for installs Real Soon Now. Lady Fleur and I have been doing nightly scavenger hunts of the installed stations and, so far, have photos of seven stations (out of 10 installed as of Tuesday afternoon). If you look at our Flickr streams you’ll see safety vests with the emblems of other Alta-operated bike share systems – they’ve brought in veterans of those other programs to install the stations and they’ve been knocking them into place in about an hour. 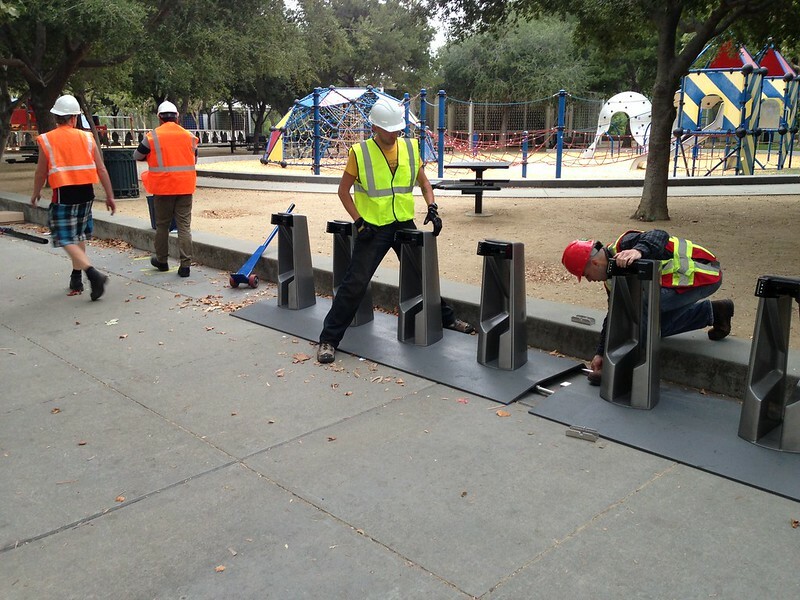 John, 15 stations in San Jose with 10 to 20 spots per station. I don’t remember how many bikes are allocated in total for San Jose. Ah … the sidewalks of San José, The Capital of Silicon Valley. So much room for street furniture, what with the complete lack of pedestrians and all. allocated for San Jose? Does that mean I can’t take one from Mountain View, get on Caltrain, and drop it off in San Jose? Have you been to San Jose recently? You could theoretically do that, but it doesn’t make sense in the context of the system. You could just as easily drop off a bike at Mt View Caltrain and pick up another bike at Diridon and take it to your final destination in San Jose. I need to work on my comedy routine apparently, usually I am not taken so literally. My general curiousity is whether or not the bikes are supposed to be allocated to a certain city? One could theoretically envision checking out a bike in Palo Alto, and riding it to Redwood City, for free, rather than paying Caltrain $5 for a one way ticket. I still believe that the bikes should be a different color….